Learning the latest industry news and networking over drinks and dinner! On the 21-22 June 2018, ETIRA met in Budapest, Hungary for its annual member meeting, and for The Recycler Live Conference. The event was a top opportunity for networking and learning, held this year at the beautiful Corinthia hotel. With 90+ delegates, and organised by The Recycler magazine, The Recycler Live Conference is the 2nd largest industry event in Europe after remanexpo@paperworld. On Thursday, ETIRA held its internal Board meeting and annual statutory meeting. The association approved its 2017 financial statements and reset its 2018 budget. Members evaluated the 2017/2018 activities and the work done by ETIRA in the past 12 months, They also assessed the priorities for 2018. 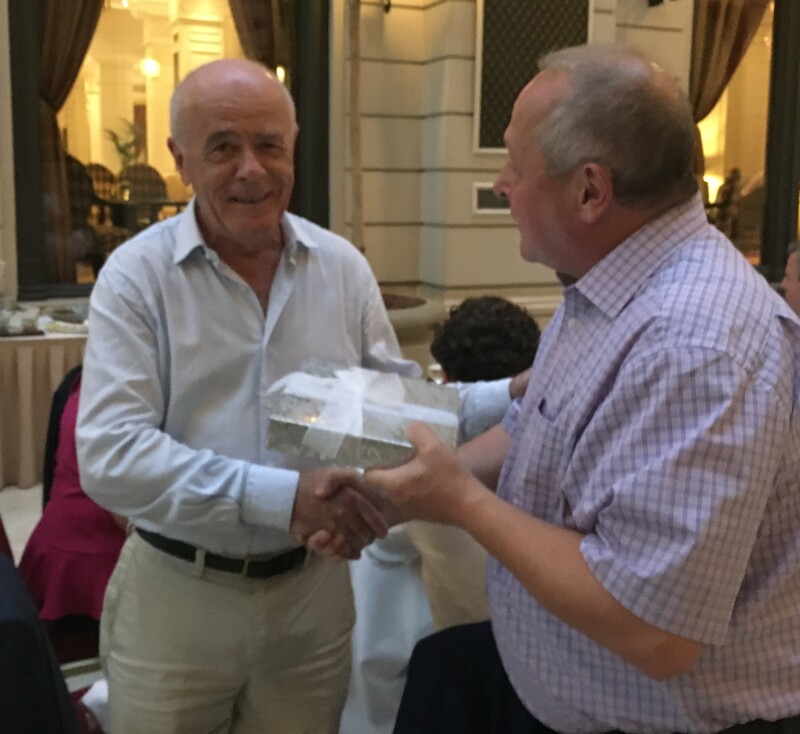 David Connett (r.) also thanked outgoing Treasurer Philippe Guenin (LVL) for his years of service to oversee the association’s finances. Board Member Gerwald van der Gijp (Armor) will succeed Philippe in this role. Incoming President David Connett (l.) says thank you and farewell to Christian Wernhart (Embatex) after 12 successful years at the helm of the European cartridge remanufacturing trade association. Friday saw an impressive group of speakers addressing the floor on many topics facing remanufacturers today. Industry magazine The Recycler will report extensively on the many presentations. And the Thursday Cocktail and Dinner were great for informal networking and new business opportunities! On Thursday, ETIRA elected a new Board of Directors for the mandate 2018-2020. 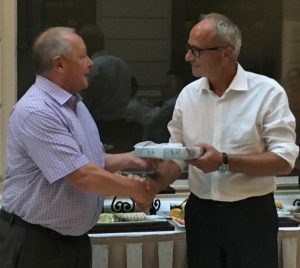 President Christian Wernhart (Embatex) stepped down after 12 years at the head of the association but will continue as a regular Board member. David Connett, founding Member of ETIRA and long-time Vice-President, succeeded Wernhart as President. Also stepping down were Stephanie Unland (The Recycler) and Treasurer Philippe GUENIN (LVL). ETIRA thanked all three for their support throughout the many years! Reappointed members of the Board include ARMOR’s Gerwald van der Gijp (elected as new Treasurer), Jörgen Wonisch (Greenman), Jan-Michael Sieg (KMP) and Javier Martinez (Consuprint). Former editor of The Recycler David Connett will take up the role of President at a crucial juncture. Due to the tough market environment and changes among the membership, the association is facing new challenges. Connett is keen to address those head-on: for ETIRA, member interests come first. Also, a larger focus on conveying the reman message to the outside world will bring new boosts for the industry as a whole. ETIRA thanks organisers The Recycler magazine and the sponsors for a very successful 2-day event in Budapest!